Bad news for hikers, bikers and other trail users: It could be a while before any north valley trails are dry enough to take on. Mud season is in full swing, and Ketchum District Ranger Kurt Nelson said it's doing a number on the Forest Service trails north of Ketchum and Sun Valley. "We still have a lot of snow in the high country and even midway up, so that's kind of our dilemma right now," he said. Cooler than normal temperatures and even new snow throughout April kept the region's snowpack active much later than usual. Greg Martin, Wood River Trails coordinator for the Blaine County Recreation District, said district workers were shoveling snow off of the district's south valley trails as late as last week in an attempt to make them ready to ride. But snow on the trails isn't the only problem, Martin said. "It's not just snow up there, it's also the runoff keeping the ground really wet and soft," he said. The situation is somewhat similar to last year's, when rain throughout May and June led to a prolonged mud season. It's not just that recreationists are chomping at the bit—Nelson said the trail openings are later than usual this year. "We're probably running at least two to three weeks behind," Nelson said. The problem with wet trails is that soft, moist soil can be easily rutted, compromising the trail's integrity, by mountain bikers, horseback riders and even hikers if they take on the trail before it dries out. Martin said riding on soft trails before they're ready can cause "cupping," where water stands in the ruts. The trail eventually requires serious repairs. Nelson said that the Forest Service enforces trail closures. Hikers, bikers and other recreationists caught on closed trails will be issued a citation and required to pay a fine up to $5,000. Nelson said he expects trail users to use good judgment and does not anticipate issuing many warnings, especially as most users understand the effects of use on a wet trail. "It's their trails, and it's up to everyone to do their part," he said. Both Nelson and Martin said they expected more trails to open over the next few weeks. One of the only north valley trails currently open is the Adams Gulch-Lake Creek Connector that leaves the Adams Gulch trailhead and goes north to Hulen Meadows. This trail is only open for half a mile, then closed due to snow and mud. All other trails branching off of the Adams Gulch trailhead are closed with the exception of Lane's Trail, which is open to the picnic table but closed beyond. While Nelson said trails north of Ketchum would likely be wet for a while, he added that there may be more options later this month. "We're asking people to be patient," he said. "We're hoping the trails dry out." For now, Martin and Nelson recommend sticking to the south valley. Many of the trails off Croy Creek Road are dry. Nelson especially recommends Lamb's Gulch, a choice endorsed by Martin as well. Nelson said the Forest Service will continue to issue updates as more trails are opened. 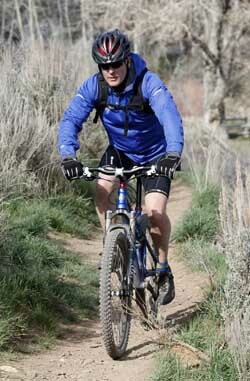 Martin maintains a comprehensive listing of Forest Service, Bureau of Land Management and recreation district trails on his website, www.woodriverbike.wordpress.com. He said the district is planning to launch an all-inclusive trails and pathways website off the district's website, www.bcrd.org, in early June. - Wood River Trail bike path system (Ketchum and Sun Valley to Bellevue, multiple access points). - Toe of the Hill (Hailey, behind the Community Campus). - Carbonate (Hailey, off Croy Creek Road just past the Big Wood). - Lambs Gulch (Hailey, off Democrat Gulch Road). - Two Dog--Bulldog (Hailey, off Croy Creek Road near the BMX track). - Hidden Valley (Hailey, off Bullion Gulch Road from the Two Dog-Bulldog trailhead). - Greenhorn Gulch (Mid-valley)—West Leg Cow Creek is open to the Cow Creek cut-across junction, first mile of East Leg Cow Creek and the entirety of the Cow Creek/Greenhorn connector. - Lake Creek (north of Ketchum, off Highway 75)—Open, but users are requested to turn back if the trail gets muddy. - Proctor (Sun Valley)—Open, but users are requested to turn back if the trail gets muddy. - Trail Creek (Sun Valley, along Trail Creek Road)—Open, but users are requested to turn back if the trail gets muddy. - All other Greenhorn-area trails. - All other Adams Gulch trails. - Fox Creek, Chocolate Gulch and Oregon Gulch trails. - Galena Lodge trails, which are set to open June 11. - Baldy Perimeter Trail, which will not open until July 1 due to elk calving. For a complete and up-to-date listing, visit www.woodriverbike.wordpress.com or www.bwbt.org.